An hour out of Portland on our first day we pulled over and ate lunch at the Playa Azul in Kalama. It wasn't so much that we were hungry, it was more that we needed a break and the timing was right for lunch. The just above average Tex-Mex would haunt us for the rest of the day. The next time we stopped for gas, another hour and a quarter up the road, our butts were tired and the thought of another six hours of riding not particularly appealing. Wondering aloud, Sledge asked if our bodies would eventually adjust to the long days of riding ahead? God, I hope so!, I replied. I'm going to be doing a lot of standing up, Sledge said. I'm tall and weigh in at 6' 3" with a 35 inch inseam and Sledge, being 6' 1" himself, is no slouch in the height department. There's a narrow range of motorcycles that fit taller riders and the Adventure category that both Lily and Verity fall into is one. Designed for on and off-road use, their long suspension and high clearance means the seat is a fair distance from the ground. When I need a break from sitting, but don't want to stop, I stand on the pegs (aka footrests). When you're on the pegs the bike's center of gravity drops and it becomes more stable, plus you get a different view of the world. More importantly the blood rushes back into your buttocks and relieves the cramps you didn't realize you had. Honestly, I've not spent any time on cruisers or other low-riding styles of bikes, but I'm not sure that I'd be confident standing up when the handle bars would be a foot lower than my knees. Which probably explains why Honda Gold Wings and Harleys look more like mobile Lay-Z-Boy loungers than motorcycles. 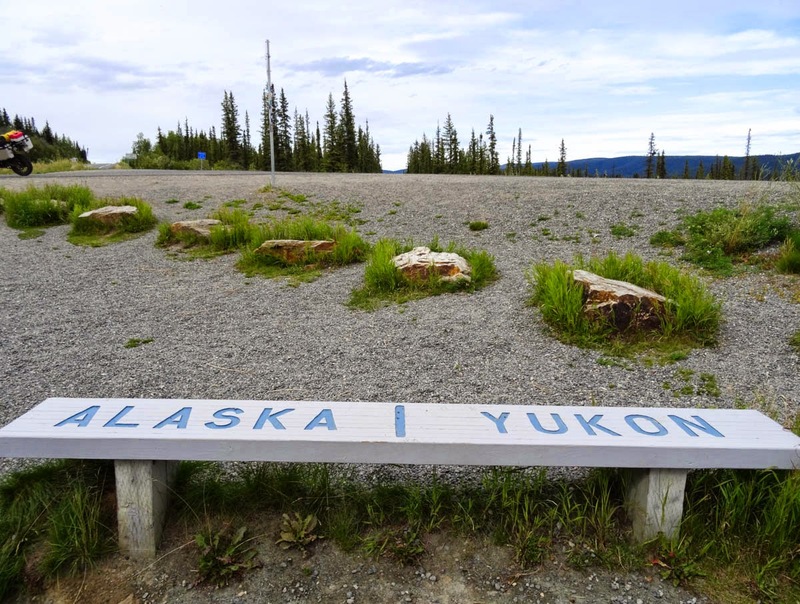 By the time we crossed the border into Alaska we'd stretched our rides out to over two hours at a time. After a week our butts weren't much happier, but standing for five minutes at 65mph kept us comfortably distracted enough that we were making good time. 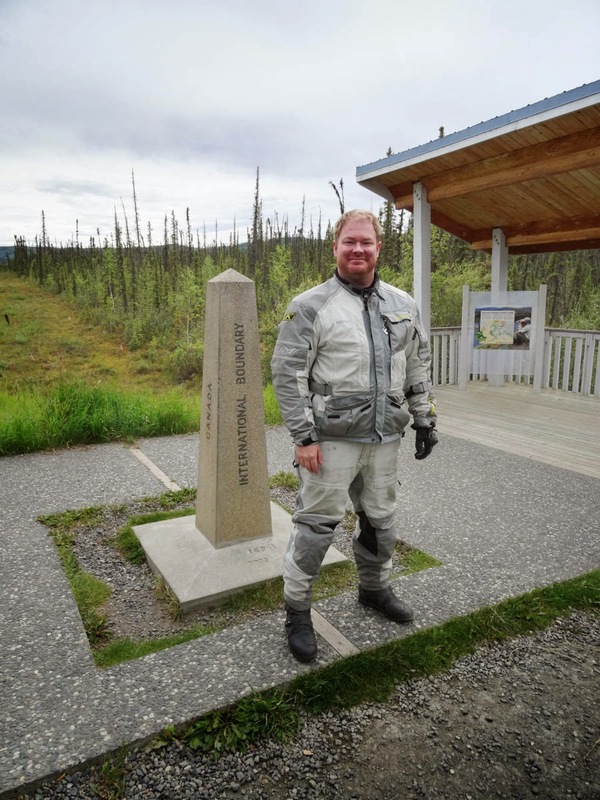 It was getting late after a long day cutting through the Yukon Territory and we still had a hundred miles to go. We'd picked up our pace to the recommended maximum our bikes would allow (never faster than the speed limit mind you!). Suddenly I got a whiff of burning rubber. I looked forward, down, and back and didn't see smoke. Then the burning smell disappeared. Sweeping through the twisties, we had our bikes leaning satisfyingly into the curves and - dang it! - there was that scent of rubber again. My tires weren't wobbling or acting weird - that would have been readily obvious on this road. Nothing sounded wrong, there wasn't any scraping or screeching, and then the smell was gone again leaving nothing but the odor of damp woodland undergrowth in its place. By the third time it came back the pattern revealed itself. Sledge has a couple of personal tricks to relieve stiffness in his hips and knees. One is to drop his leg, simply drop it off the peg and let it dangle. From where I sat following him this looked like the shortest route to an amputation there is, second only perhaps to walking through a minefield drunk on tequila, but he seemed to know exactly how far the ground was under his feet. As soon as we pulled over I asked him, are you dragging your toes on the road? He looked at me blankly and said, Yea, a little. When I get bored on these long stretches. Well, I was smelling burning rubber and wondered what the hell it was! With that, Sledge raised his right foot and looked at the sole of his expensive Italian riding boot. The toe had almost worn through. Appreciating that he was an eighth of an inch from debriding his foot to the bone, Sledge broke out a sheepish smile and said, I never liked these boots anyway!